A rare, 3,000-year-old sculpture sold for $31 million at Christie's New York Wednesday, shattering the previous world record for Assyrian art. The sculpture tripled its pre-sale estimate of $10 million, and the buyer remains anonymous. 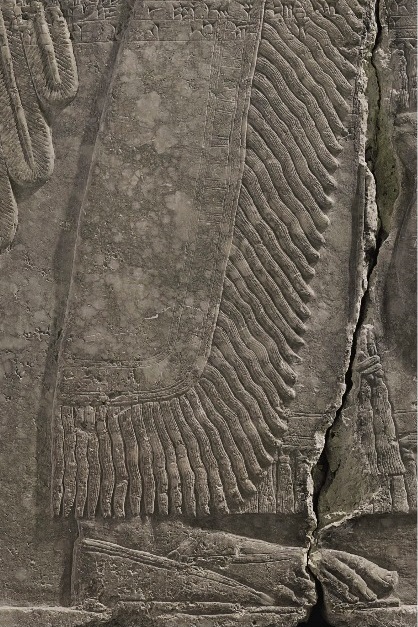 The sculpted panel was excavated in the 19th century from the ruins of the Northwest Palace in Nimrud, in present-day Iraq. For years, it remained in a private library with its value unknown. The cultural treasures of Nimrud made headlines in 2015 when ISIS occupied Mosul, 20 miles to its north, and used barrel bombs, bulldozers, power tools and sledgehammers to reduce the site to rubble. 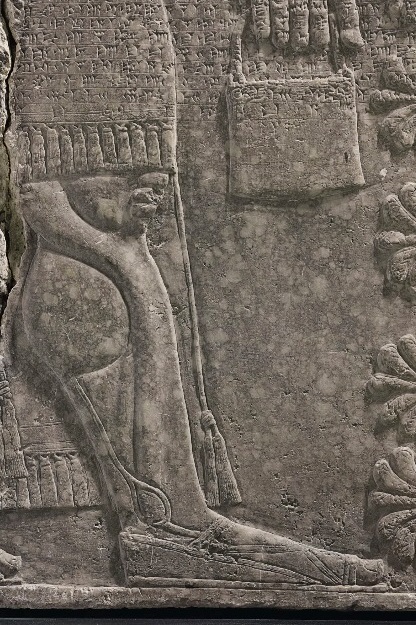 Christie's auction of this solid slab of gypsum depicting a seven foot-tall deity marked the first high-profile sale of an Assyrian antiquity since then. 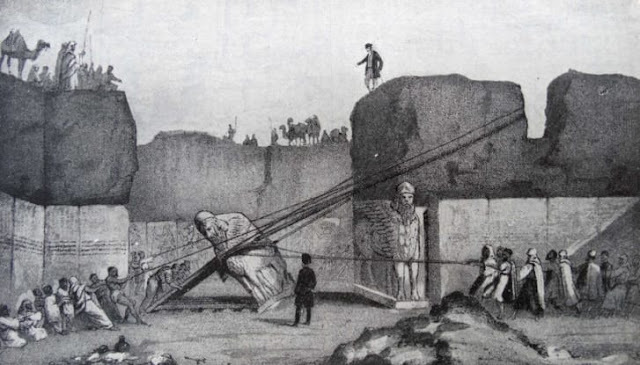 In 1845, a young British adventurer called Austen Henry Layard arrived in Nimrud and began excavations. Since the collapse of the Assyrian Empire towards the end of the 7th century BC, the site had remained relatively untouched and he found a wealth of archaeological gems. At the time, Iraq was part of the Ottoman Empire, and its Turkish rulers appear to have seen no problem in Layard stripping the region of much of its heritage. The Grand Vizier of the Ottoman Sultan wrote a letter to Stratford Canning, the then British ambassador, which -- in the words of its recipient -- authorized Layard to "excavate and export to your heart's content." Layard did exactly that. 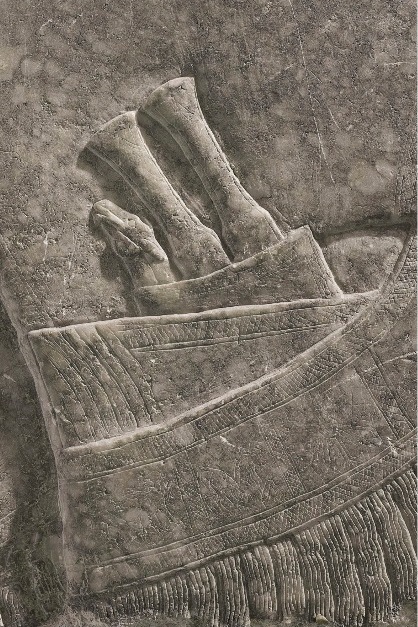 He sent the majority of the antiquities to London, where they now form the core of the British Museum's Assyrian collection. Layard's incredible findings also caught the attention of American missionaries. 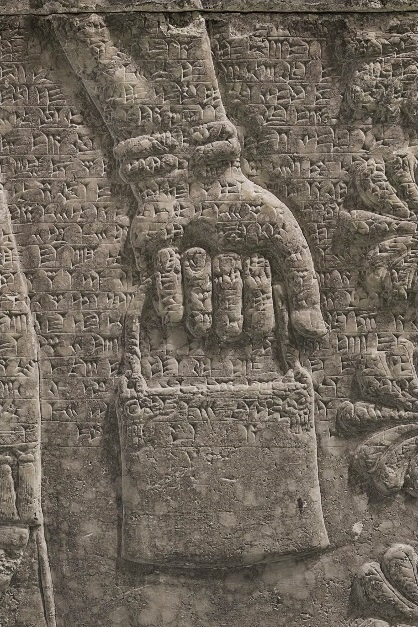 The Assyrian empire is referenced in the Old Testament, but its ruins had not been located. 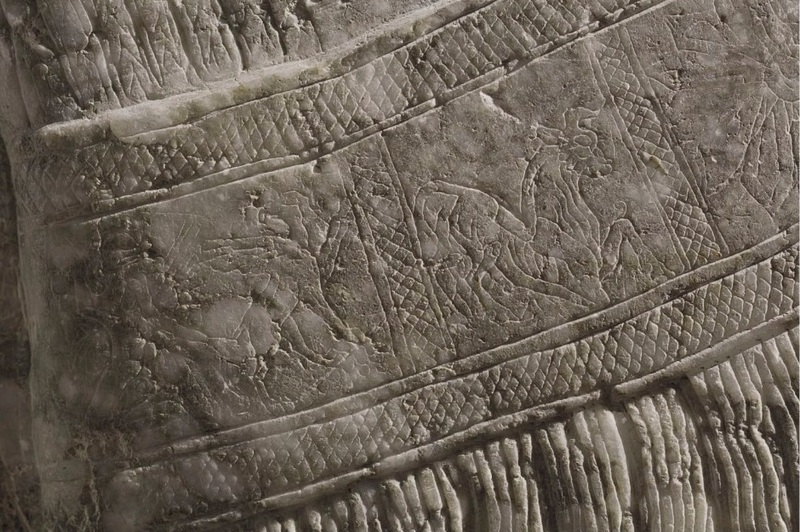 The monuments confirmed its existence and, to the missionaries, "proved that the Bible was real and not a work of fiction," said Max Bernheimer, Christie's international head of antiquities. "It fed the religious fervor of the time," he added. In 1859, one of those missionaries -- Henri Byron Haskell -- acquired three relief panels on behalf of his friend Joseph Packard, a professor at Virginia Theological Seminary, near Washington DC. The seminary provides postgraduate education to members of the Episcopal Church. The panels were a bargain -- bought for $75 each, with most of that cost covering the shipping fees. Since their arrival, the panels have been displayed in the seminary's library, and were primarily considered a scholarly resource rather than works of art. A routine audit in 2017, however, revealed the value of the panels and sent insurance premiums skyrocketing to $70,000 a year. That prompted the decision to sell one. The proceeds of the sale will support the preservation and study of the two remaining panels, and benefit the seminary's scholarship fund. In the lead up to the auction, the Iraqi Ministry of Culture called for the panel to be returned to Iraq, and activists had suggested a protest outside Christie's during the sale. A spokesman for Christie's said that while the auction house was "sensitive to claims for restitution by source countries," it had been reassured by law enforcement authorities that there was no legal basis for a cultural property claim in this case. The Northwest Palace was the crowning architectural achievement of King Ashurnasirpal II, who ruled from 883 to 859 BC. 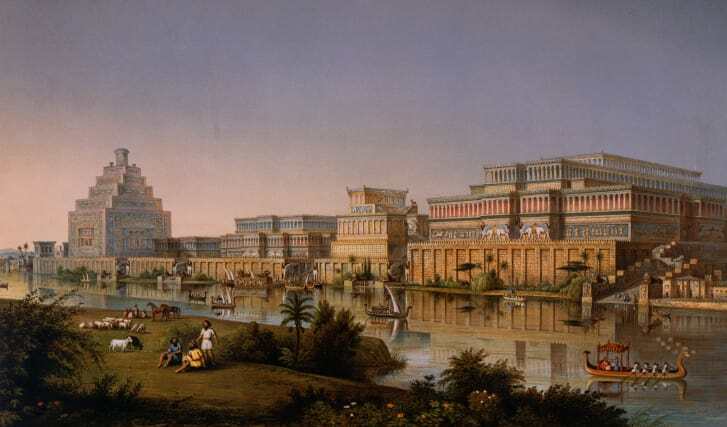 When complete, it was the largest and most lavishly decorated building in the Assyrian Empire. 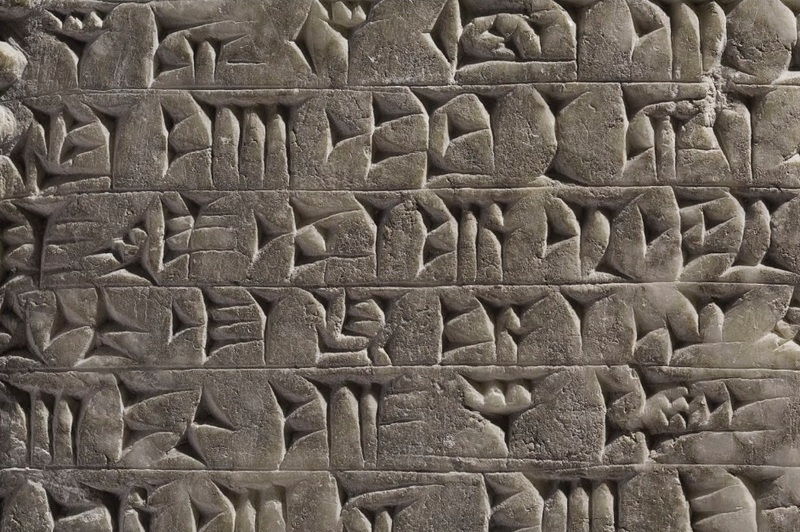 "Ashurnasirpal was the big kahuna, as it were, of his age," said Bernheimer. 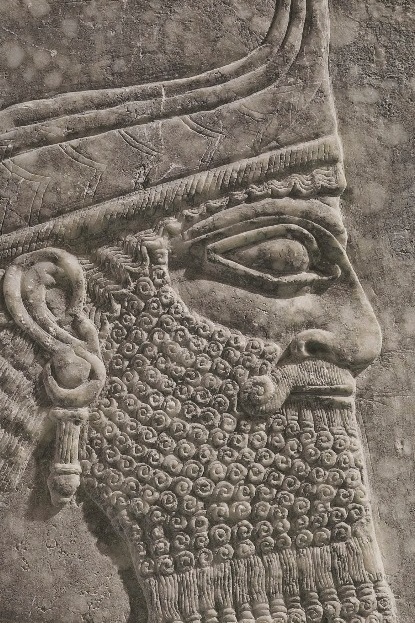 The king expanded his territory by mounting a series of ruthless military campaigns and established a new capital at Nimrud -- called Kalhu at the time. Ashurnasirpal fitted out his new city with a citadel, defensive walls, four palaces, temples and townhouses, using the wealth that flowed in from his conquests, and the labor of subjugated slaves. 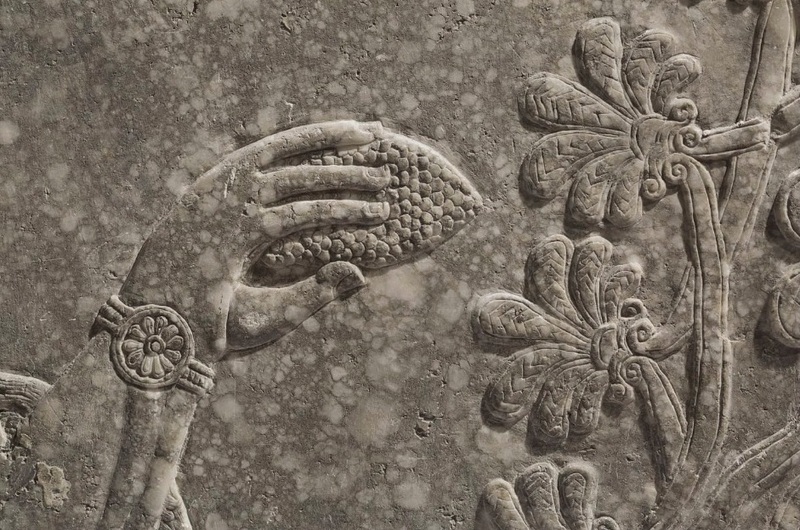 The Northwest Palace's interior walls were lined with more than 400 sculpted relief panels. 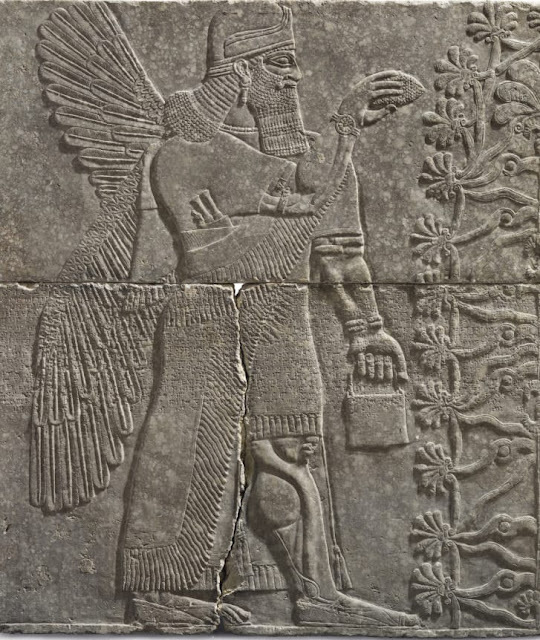 The winged genius was the most common design, but some panels depicted Ashurnasirpal's empire-building conquests, religious events, royal hunting scenes and courtly banquets. Panels like the one being auctioned were designed to "impress and overwhelm," said Bernheimer. "Standing next to it, you feel the power," he added. Towering and richly-detailed, the carved figure is depicted in profile and the face of the muscular, bearded god resembles that of Ashurnasirpal. 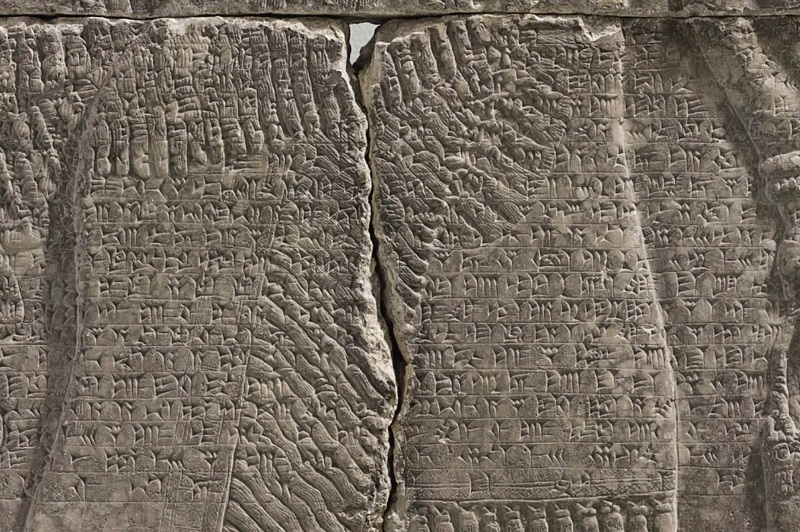 A band of text written in cuneiform -- one of the earliest systems of writing -- runs across the center of the relief. 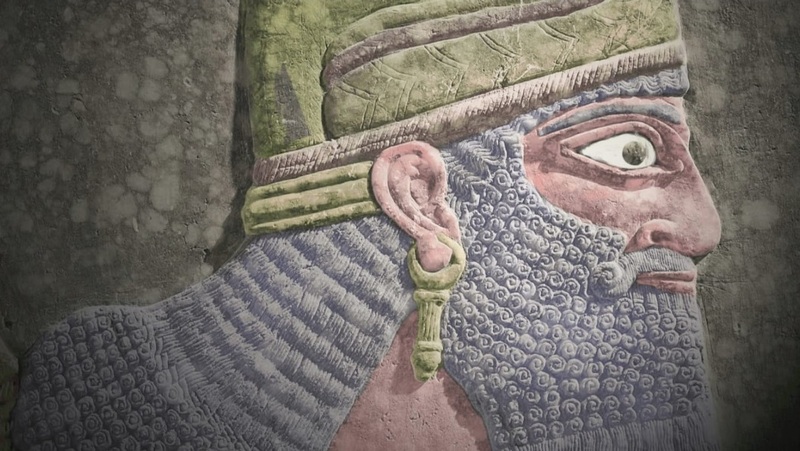 It tells of Ashurnasirpal's ancestry, his military triumphs, the extent of his empire and the construction of the Northwest Palace. 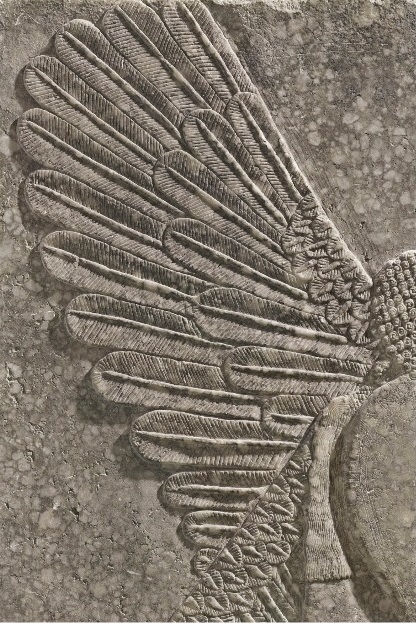 "Ashurnasirpal, the exalted prince, the one who fears the great gods, the fierce monarch, the one who conquers cities and mountains in their entire extent, the king of lords, who destroys dangerous (enemies), crowned with splendor, fearless in battle, the merciless hero ..."
This particular winged genius adorned a space that archaeologists call Room S, which connected a public central courtyard to the king's private rooms. "It seems to have been an intimate area, rather than an audience chamber," said Bernheimer. Along the walls, the winged genius was repeated over and over and over again. "Whatever was happening in Room S," said Bernheimer, "must have been considered very important to require so much protection from the gods."